Can't Hide the Effects of Global Warming in Alaska! But it turns out that in Alaska, a degree or two can be the difference between freezing and not-freezing, which makes all the difference in the world. What happens when Alaska thaws out of season? Permafrost is a layer of permanently frozen ground which you find in very cold climates, frozen solid and thick for thousands of years. Much of Alaska is standing on permafrost, and people have built their homes, roads, schools, light poles, power lines,and buildings on it. Unfortunately, due to the effects of global warming in the last several years, it's been melting! The roads cave in. A study done at the University of Alaska in Fairbanks found that when the temperature of the ground thaws by 3 degrees C, its load capacity decreases by 70%. People's homes get closer and closer to the ocean, and more and more frequently the increasingly violent winter storms threaten to wash them away - and do. Native hunters are forced to take greater risks every year - and many times with tragic results - to get enough meat to feed their families. Inupiat people dig into permafrost to store their meat through the year. 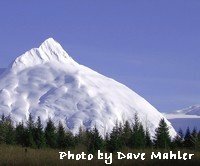 Several have lost meat caches in the storms and unseasonal thaws, and the elders have been talking lately about the need to get refrigeration to insure their food doesn't spoil - an idea their parents would have laughed at. Inland lakes are drained of their water, so animals, plants and people who depend on the lakes for fresh water have to go elsewhere or die of thirst. The salmon-spawning rivers, once supported by permafrost, are being diverted or drying up as the permafrost partially thaws. 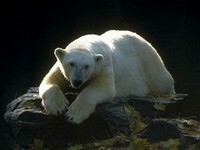 Click here to read the polar bear population status report. Where the ice meets the ocean, an abundance of wildlife thrive. In the winter, the ice grows over the Bering Strait and in the spring, it retreats. There is a thick pad of phytoplankton on the underside of the ice, and as the (freshwater) pack ice melts, the phytoplankton blooms. Animals from all over the world - including mollusks and migrating whales from the South - come to feast on the salad bar. Polar bears, seals, walruses, and birds use the ice as a floating home where they eat, have their babies, and rest. 25-30 years of satellite data have shown the effects of global warming: every year, the area consisting of pack ice is getting smaller. And the rate of loss is sharply increasing. Sonar data from Navy submarines shows that the pack ice is also getting thinner, decreasing 42% between 1950 and 2000. More icebergs in the ocean for oil tankers to run into (or try to avoid running into) and spill all their gooey, poisonous cargo into the bay. 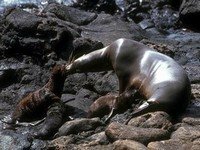 Remember the Exxon Valdez? Alcohol wasn't the only reason that tanker crashed and spilled. 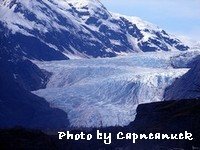 More earthquakes:The tectonic plates in Alaska are being held in place by tons of non-moving ice. 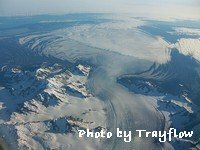 When the glacier loses weight by melting, the pressure is lifted off the plate, allowing it to move more freely...and the ground shakes. 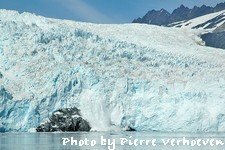 Less fresh water in the rivers and lakes:In the summer, the glaciers melt a little and water runs down to the ocean in rivers and streams. That's normal. 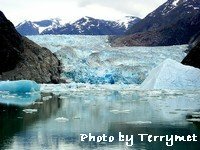 But when glaciers are smaller than they used to be, there is less water to melt off and run down to the ocean in the summer, when those dependent on the rivers and streams need it the most. More fresh water ends up in the ocean:The melted glaciers end up in the ocean, raising the sea level and disrupting the marine ecosystem. ...and it makes the salty ocean water less salty by diluting it with fresh water. What happens when you put an ocean fish into fresh water? It swells up with water and dies. Salmon are the exception -- an unusual fish adapted to both salty and freshwater environments. But not at the same time! The native elders in Alaska say that some of the effects of global warming in their region is that the salmon have more warm-water parasites than they've ever had, and that they're behaving strangely. In Southern Alaska, they're already reporting salmon kills because the temperature of the water is rapidly increasing, and the salmon cannot adapt quickly enough. The Inuit elders are reporting that more and more drowning accidents are occurring during hunting season, as the edge ice gets thinner and the waves get bigger - another of the effects of global warming. Much larger waves are making it more dangerous to go out to the whales in native boats. The sea ice is less reliable, and there is increased danger of ice -- the chunk of ice the hunter is standing on -- breaking off and floating out to sea. They say it is difficult to find a raft of ice thick and heavy enough to haul up a whale carcass. Charles Wohlforth, in his excellent book of global warming research in Alaska called "The Whale and the Supercomputer", reports observations made by the indigenous people of the Arctic on climate change. "They say the earth is faster now," he comments. "they say that the weather systems move through faster, are less predictable, and more violent." 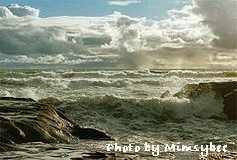 When villages must be moved because the sea is eating away the coast...Collective wisdom accumulated over centuries becomes obsolete, and the children and grandchildren of the native elders don't learn the old ways, and the culture is lost. I know, I know - for a lot of us, Alaska is a long ways from home. The pictures are incredible, but, well...so what if it warms up a little?? Albedo is the name for what happens when the sun's light and heat is reflected from a colored surface; to illustrate, take a glacier as an example. It is white, and reflects back most of the sun's heat into space, and consequently is called a high-albedo surface. The polar ice sheets are also high-albedo. The blue ocean, green plants, and brown dirt, however, reflect back very little of the sun's heat -- and are called "low-albedo" surfaces. ...and a very large global heat sink disappears -- which is the only thing that is keeping the earth's atmosphere in the range that our fragile, temperature-sensitive human bodies can tolerate. Without polar ice, we might as well be living on VENUS. The planet cannot afford to lose those big chunks of ice at the poles. Drive electric. If you think you can't afford an electric car like the Nissan Leaf, you might be surprised. My 2013 Leaf was actually cheaper than a comparable gas car when I bought it used. Or maybe you could convert an old Geo Metro to electric. Scavenge forklift parts. Consider getting an electric scooter or converting a bicycle. Recharge your electric car with solar panels on your home's roof, or a wind turbine. Taking your tailpipe out of the carbon equation really makes a difference, and feels good at the same time. Show and tell. You're an inspiration! It's amazing how a few lightning-bolt decals on your car will get people talking about electric transportation and independence from oil dictators. Thank you to Chad Kister, author of Arctic Melting, whose research provided lots of the information you just read. He's a guy whose heart is really in Alaska; he likes to hike in the wild places of Alaska like the Wildlife Refuge, and he's talked to people on his travels that live in or near the wild places.